The Paris press from Peugeot is an innovative two in one device that brings together highly accurate coffee bean grinding and high quality coffee brewing in a single tool! 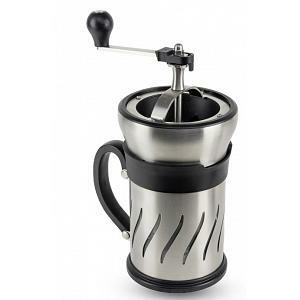 The French press is placed directly onto the cafetiere and its mechanism has a lifetime warranty and can be adjusted from anywhere from very fine to very coarse grinds. Simply turn the top handle to grind your coffee beans and are then transferred directly into the cafetiere. Now, pour hot water and leave it brewing for 5 minutes and press the plunger down the press. The Paris coffee press makes 4 cups of coffee, comes in with a spoon, and is made in France from stainless steel and borosilicate glass (carafe).